Fighting back tears while his hands trembled, Felix Hernandez signed a seven-year contract with the Seattle Mariners on Wednesday that made him the highest-paid pitcher in baseball. His hands trembled, his breath quickened and his eyes began to fill with tears. 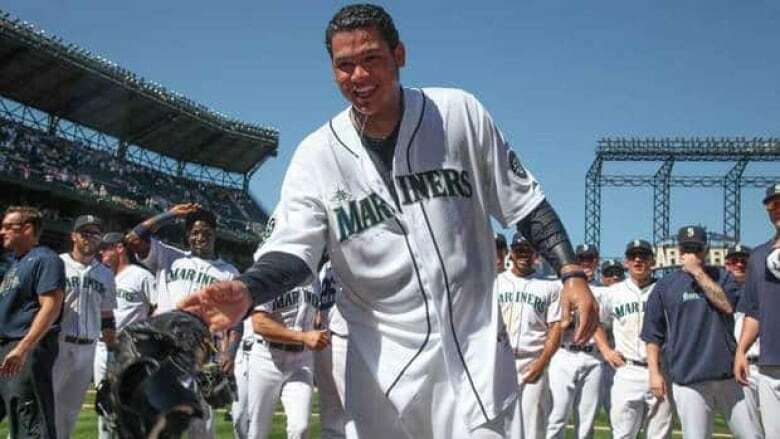 Felix Hernandez looked down at the piece of paper containing details of the largest contract ever placed in front of a pitcher and emotion took over. Hernandez never hid his desire to be with the Seattle Mariners, even when he seemed destined for a bigger market, a bigger stage to showcase one of the most dynamic arms in baseball. So when Hernandez signed his new seven-year contract on Wednesday with the Mariners to become the highest-paid pitcher in baseball, his goal of staying with the only franchise he's even known became reality. That's why he nervously shook and paused on multiple occasions to gain his composure. It was raw. It was genuine. It was why he's become affectionately known by Seattle fans as King Felix. "I always say that this is home," Hernandez said. "This is my life." The $175 million US pact covered the final two years of his existing deal that was scheduled to run through the 2014 season and added five additional years through the 2019 season. The contract is fully guaranteed, Mariners general manager Jack Zduriencik said. Hernandez also got a full no-trade clause, the first one given by the franchise. King Felix got a ransom — and then some. Why not? For a franchise that's gone more than a decade since last reaching the post-season, Hernandez is the best thing the Mariners have going. Hernandez never wanted to try the open market and Zduriencik was going to make sure his ace never left. Scott Pucino, one of Hernandez's representatives, said his client bluntly told him last May that the job was to keep him in Seattle. The first conversations between Hernandez's reps and Zduriencik started last September. It was a long process that appeared to be further delayed by reports late last week that there could be an issue with Hernandez's elbow. Zduriencik said team doctors gave Hernandez was given a "clean bill of health." And the contract was completed before spring training as all parties wanted. "I'm different. It's the way my family raised me. If you feel comfortable in a place — now I'm the reporter — if you feel comfortable and happy and you believe in people, are you going to go anywhere?" Hernandez said. "I'm different. I'm different. It happened." Hernandez was greeted Wednesday by Mariners front-office staff all wearing yellow "Kings Court" T-shirts that have become a special section of the stadium for all of his starts. That started his waves of emotional roller coaster. At one point, while dabbing his eyes, he looked over to his young son and daughter, and broke out into a grin after getting a pair of thumbs up. "It was emotional because this is a big thing. This is a big dream," he said. Hernandez's total dollars would top CC Sabathia's original $161 million, seven-year contract with the New York Yankees. The $25 million-a-year average would surpass Zack Greinke's $24.5 million under his new contract with the Los Angeles Dodgers and tie him for the second-highest contract overall in baseball with Josh Hamilton and Ryan Howard behind Alex Rodriguez ($27.5 million). Hernandez's new money would average $26.9 million over five years. The no-trade clause was a major part of the negotiations, Pucino said. "I think it's important more than anything that he wanted to be here. He was expressing this over and over and over," Mariners CEO Howard Lincoln said. "That's pretty unusual. How many players tell you to your face, 'I'd really like to stay here.' That makes you feel pretty good." This is the second time Hernandez has decided to stay with Seattle rather than seeing what could come his way in free agency. He signed a five-year deal with the Mariners before the 2010 season coming off a 19-win season and just before he won the 2010 AL Cy Young Award. He's represented hope for the franchise since he made his debut as a 19-year-old who wore his hat crooked. "He's going to be here for a long time and I think it says a lot about his character and what Seattle means to him and what the Mariners mean to him but I think it also says a lot about his belief in the direction this big league club is going and the organization is going," Seattle manager Eric Wedge said. Hernandez will turn 27 on April 8 and still be just 33 when he enters the final season of this new contract in 2019. He is 98-76 with a 3.22 ERA in eight seasons with the Mariners, a record that would be far better if he didn't pitch for the worst offensive team in baseball each of the last three seasons. But Hernandez said he can see the potential in what the Mariners have put together. Now Seattle's challenge is doing what it can to ensure Hernandez gets to pitch on the biggest stage — the post-season. "I think this officially quiets the whispers. We were committed to keeping him here a long time," Zduriencik said. "He's a young, talented guy. We all recognize that. The best thing I can say: He's ours. He's ours and we kept him."